I love this recipe originally from Ina Garten. My husband and I crave Chinese food and flavors, particularly this time of year. In the winter, I tend to stick to the old standbys: vegetable soup, chili, meatloaf, chicken and dumplings. 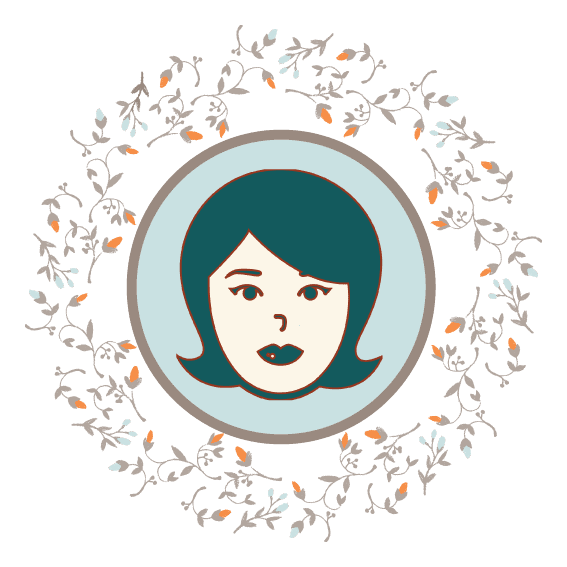 All great stuff, but during the seasonal transition from winter to spring, I thought it was time to challenge our taste buds – what about something Asian? This dish came readily to mind believe it or not, because I had almost all the ingredients on hand. This is not a light dish, and not something that leaps to the fore when it’s cold. The noodles are served at room temperature, but I warmed up dinner with a couple of baked chicken breasts. There are lots of vegetables, is it healthy, well you be the judge. However, Crunchy Asian Noodle Salad is very satisfying. The original recipe makes a lot of dressing. Awesome and outrageously yummy, but the amount overwhelms the pasta and vegetables. It calls for one cup of salad oil, and for me that’s way too much. You can use regular spaghetti or Japanese udon, but be careful of what kind of pasta you use. I had thick spaghetti in my pantry, so that’s what ended up in the bowl. The ratio of dressing to pasta/veggies might be improved if you used thin spaghetti, spaghettini, (not angel hair or capellini). Because thin spaghetti is, of course, thinner than what I used, the volume dressing might be needed to evenly distribute over the noodles and vegetables. Or you could use more pasta. Why not? Here are the ingredients or most of them anyway. 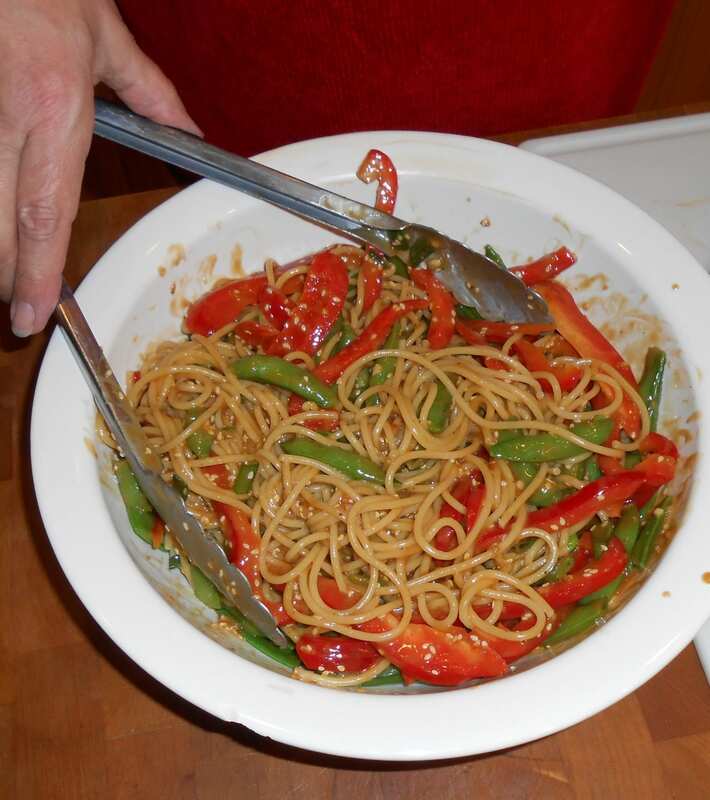 Honey, Rice Vinegar, Peanut Butter, White Sesame Seeds, Green Onions, Garlic, Soy Sauce Ginger, Red Bell Pepper, Spaghetti, frozen Sugar Snap Peas. Go ahead and start your water to boil for the spaghetti – remember to salt the water, which I do as the water is boiling and just before I put the pasta in the pot. Some pasta aficionados will tell you to salt the water so it tastes like the sea. I have no point of reference here – I live in Montana. I need to get out more. One red bell pepper, four green onions with green tops, two garlic cloves, one teaspoon grated ginger. First, I prepare the vegetables, mince the garlic, and grate the ginger. Some folks use a spoon or knife to peel the ginger. I use a potato peeler, put the unused root in a freezer bag, and chuck the whole thing into the freezer for another day. 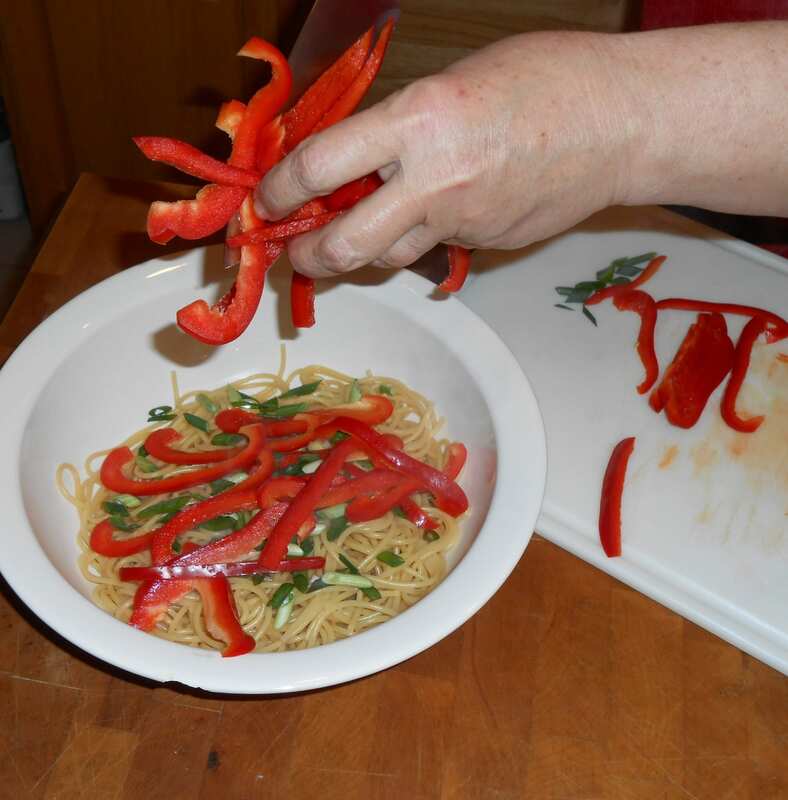 I cut the onions on the diagonal and slice the peppers into thin strips to closely match the thickness of the pasta. Then, I toasted three tablespoonsful of white sesame seeds. I’m a spice junkie – yes, I have lots of white sesame seeds in the pantry, you know, just in case. I have a great little 6″ cast iron skillet that I use to toast spices. I also have an electric stove. 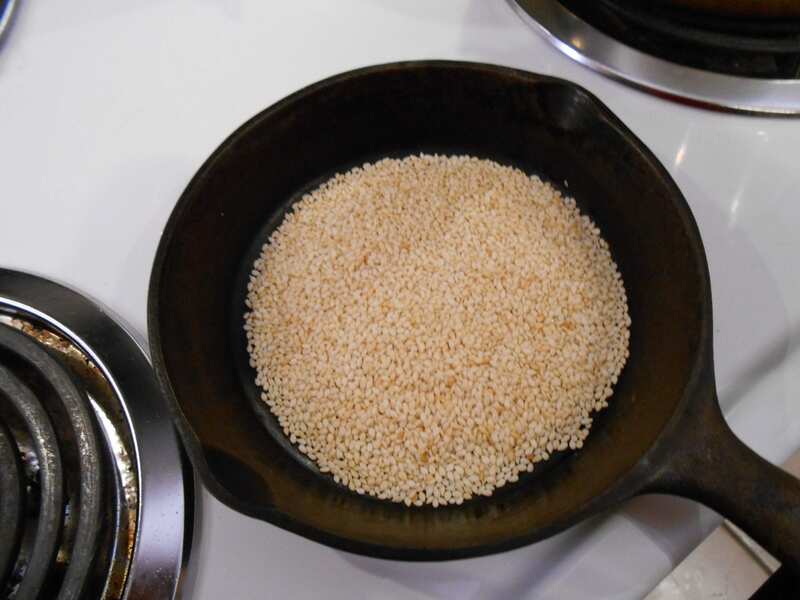 Over medium heat, begin to heat the sesame seeds and shake them around in the skillet as they begin to warm. You need to keep an eye on the sesames, because once they begin to toast, it goes quickly. I usually shake them around and return the skillet to the heat until I can see the seeds are beginning to brown and I can smell them roasting. Once the seeds begin to turn brown, continue to shake and heat. Just before you think they’re done, remove the skillet from the burner. The residual heat from the pan will continue roasting the seeds, and you don’t want them to go too far. Keep shaking them in the skillet for a little bit until the skillet cools down. I did not take a picture of making the dressing, sorry. It is an easy process. It smells awesomely and outrageously yummy, and is the reason this recipe is one of my favorites. 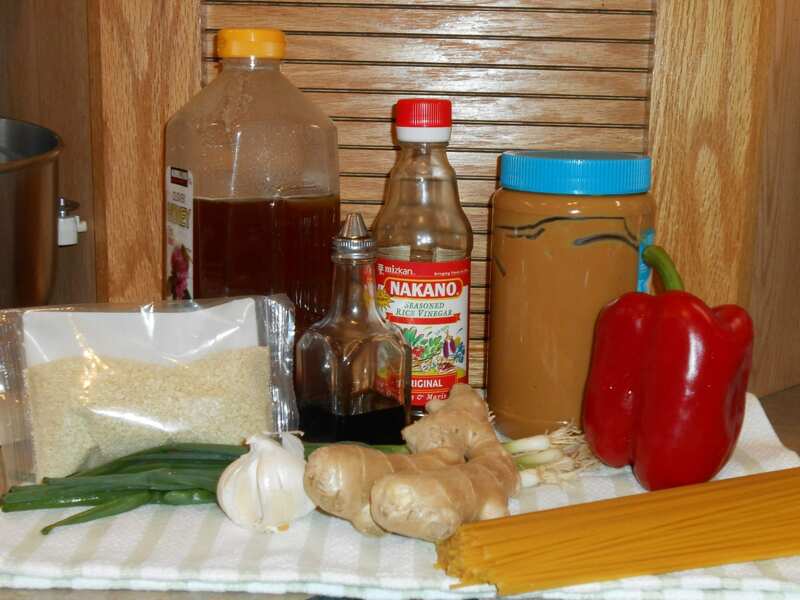 One-half cup vegetable oil, one-half cup peanut butter – creamy or chunky, one-fourth cup rice vinegar, one-third cup soy sauce, three tablespoons sesame oil, one tablespoon honey, two minced garlic cloves, two tablespoons of your roasted sesame seeds, one teaspoon grated ginger, one teaspoonful or less crushed red pepper flakes – depending on how hot you like it, salt & pepper to taste. (Don’t worry – recipe follows) Whisk the dressing ingredients together until everything is creamy – I used my trusty 4-cup measure. You’ll see bits of sesame seeds, grated ginger and garlic disbursed about, a lovely emulsion – no need to whisk the thing into submission – it will get creamy with some gentle encouragement. Now, here is where things get interesting. My thick pasta took 11 minutes to cook to al dente. The pasta you decide to use may not take as long to boil, which is why I do not boil the pasta as I am preparing the vegetables and dressing. I want the pasta to be warm when I add the dressing, so it can absorb as much possible. Cooking the pasta is the last thing I do before assembling the dish. So, use your judgment and the pasta’s label directions for timing. You can, however, heat the bag of frozen sugar snap peas in the mircowave while the pasta is cooking. I under-nuke the peas, so they’re a little crisp and not mushy, and so they’re ready to throw into the bowl when you’re ready to mix everything together. Warm, drained pasta in the bowl, I throw in the green onions and red pepper. Dress it . 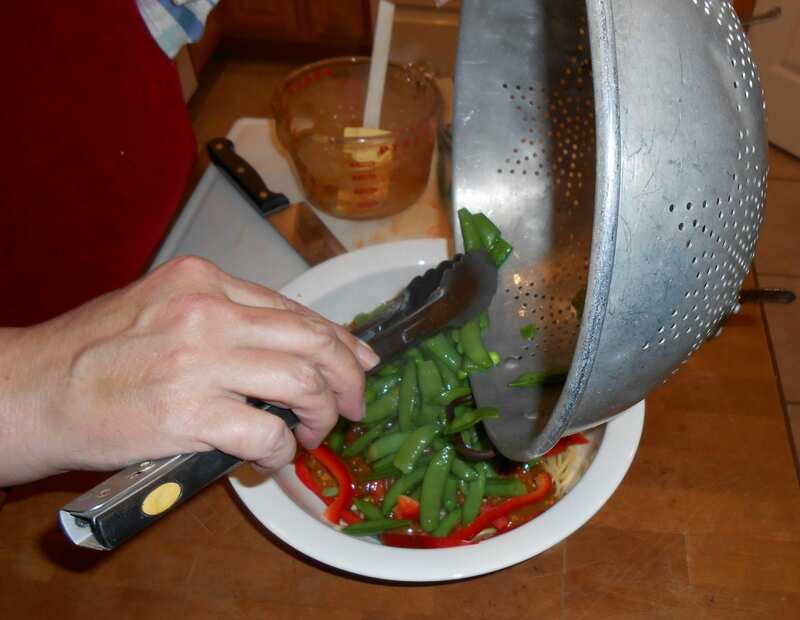 . .
Add the cooked sugar snap peas and toss around . . .
Sprinkle on the rest of the sesame seeds and be ready for an Asian flavor explosion! Oh, you can sprinkle some finely chopped parsley before you serve. Personally, I’m not a big parsley fan, but it does add some additional color to the dish. Come to think of it, you could also mix the dressing in the serving bowl, add the pasta and toss. Then add the vegetables, toss again, sprinkle with seeds. Save having to clean a bowl. Also, this salad is appropriate picnic fare. Mix everything together, put it in a plastic container, and keep it in the cooler until you’re ready to eat. Put a large pot on the stove to boil to cook the noodles. Cook the pasta according to the package directions and drain. Microwave the sugar snap peas according to package directions and set aside to cool. 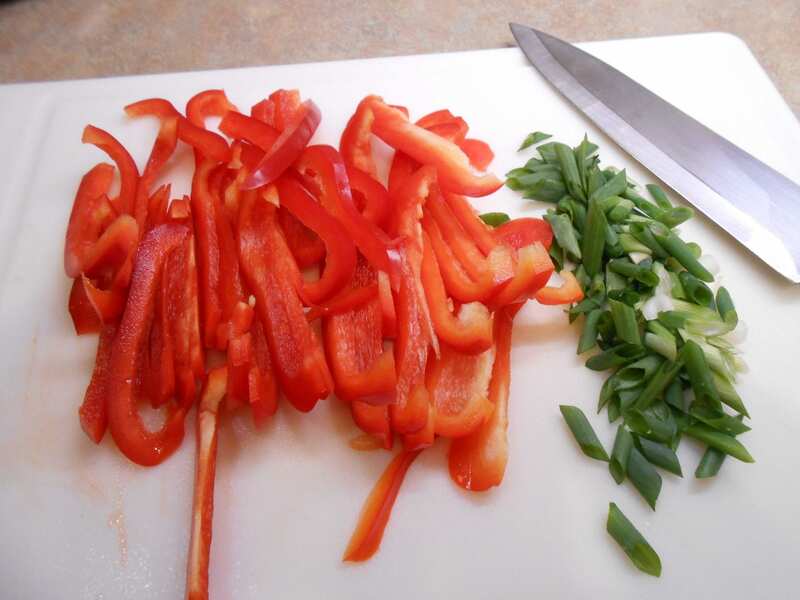 Slice the red bell pepper into thin strips. Slice the green onions into 1½" pieces on the diagonal. Mince the garlic cloves. Grate the fresh ginger. 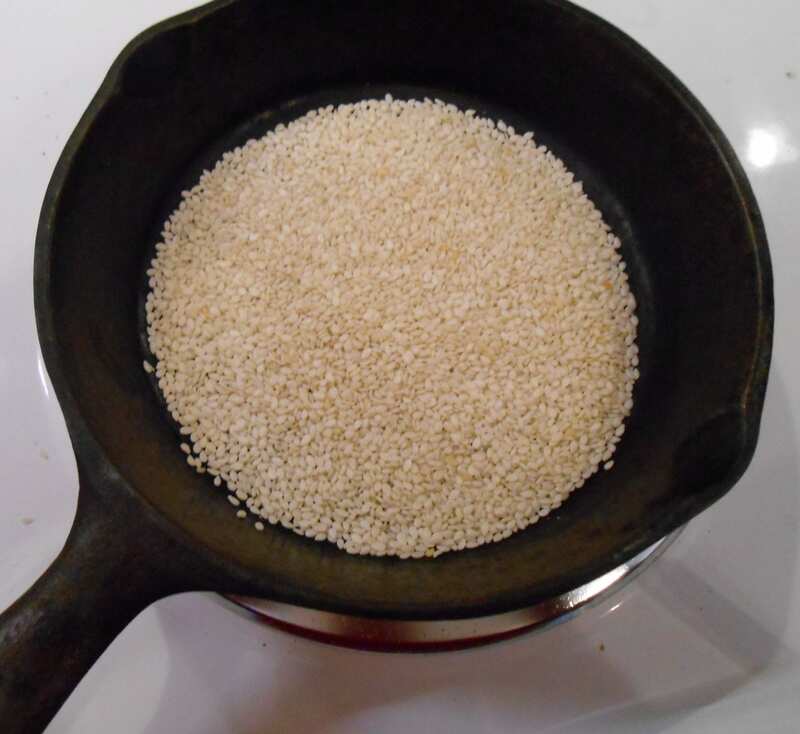 Put the oil, vinegar, soy sauce, sesame oil, peanut butter, honey, minced garlic, grated ginger, salt, pepper, red pepper flakes, and 2 tablespoonsful of the toasted sesame seeds into a bowl. Whisk the mixture together until you have a nice, fragrant emulsion. Set aside. 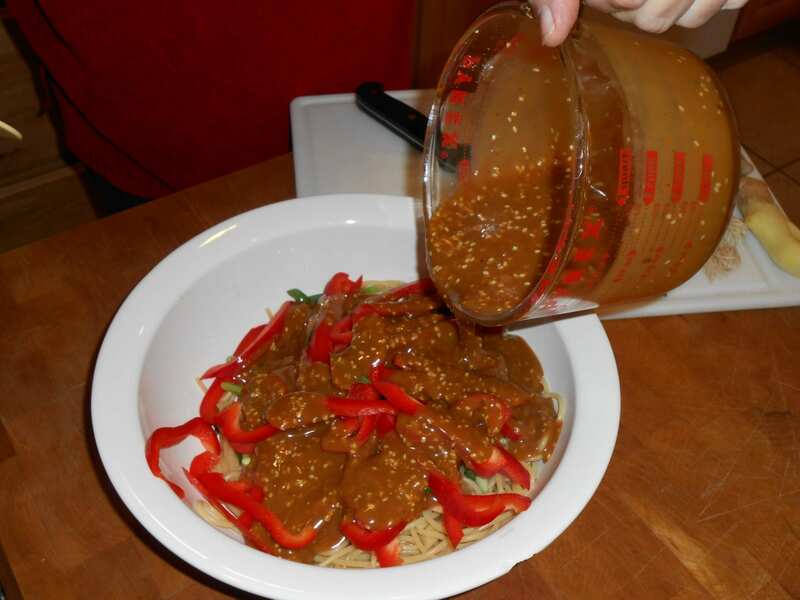 Put the cooked, drained and warm noodles in a serving bowl. Add the sliced red peppers, green onions, and sugar snap peas. Pour over the dressing and toss until all the noodles and vegetables are thoroughly coated. Sprinkle with the leftover toasted sesame seeds. Serve. Also, this salad is appropriate picnic fare. Mix everything together, put it in a plastic container, and keep it in the cooler until you're ready to eat.